SHUTTER JIHAD ISLAMIC SITES & VIDEOS: Al-Qaeda Web Forums Abruptly Taken Offline; Ellen Knickmeyer Washington Post, Oct. 18/08 ..DUBAI, United Arab Emirates — Four of the five main online forums that al-Qaeda‘s media wing uses to distribute statements by Osama bin Laden and other extremists have been disabled since mid-September leaving Al Qaeda’s Propaganda Network ‘Hanging by a Thread’. The disappearance of the forums on Sept. 10 — and al-Qaeda’s apparent inability to restore them or create alternate online venues, as it has before — has curbed the organization’s dissemination of the words and images of its fugitive leaders. On Sept. 29, a statement by the al-Fajr Media Center, a distribution network created by supporters of al-Qaeda and other Sunni extremist groups, said the forums had disappeared “for technical reasons,” and it urged followers not to trust look-alike sites. 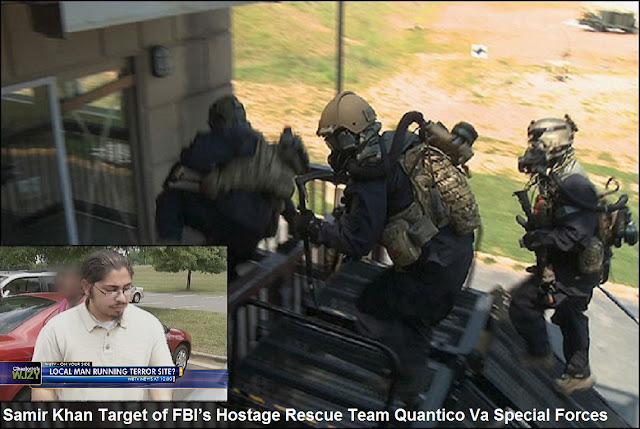 For al-Qaeda, “these sites are the equivalent of pentagon.mil, whitehouse.gov, att.com,” said Evan F. Kohlmann, an expert on online al-Qaeda operations who has advised the FBI and others. With just one authorized al-Qaeda site still in business, “this has left al-Qaeda’s propaganda strategy hanging by a very narrow thread.” The sabotage of sites operated by extremist groups makes it more difficult for those groups to inspire attacks and recruit attackers, said Erich Marquardt, editor in chief of the Sentinel, a monthly online publication by the Combating Terrorism Center at the U.S. Military Academy at West Point. It could be those pesky “Cyber Vigilantes Who Track Extremist Web Sites” at work again. AL-QAEDA TERROR WEBSITE WWW.AL-EKHLAAS.NET THAT POSTED THREAT TO KILL GORDON BROWN AND TONY BLAIR IS SHUT DOWN TODAY. Five Muslim men arrested under terrorism legislation are being questioned over internet threats to kill Gordon Brown and the former Prime Minister Tony Blair. One of the men being questioned by police in Manchester is suspected of posting a death threat on a recognised jihadi website and styling himself Sheikh Umar Rabie al-Khalaila, leader of al-Qaeda in Britain. The message, written in English, appeared only briefly on January 24th, 2008. The website http://www.al-ekhlaas.net/forum/ was shut down in Tampa Fl, USA on Jan 28th, 2008. The five arrested are British-born Muslims of Asian origin (Pakistani). 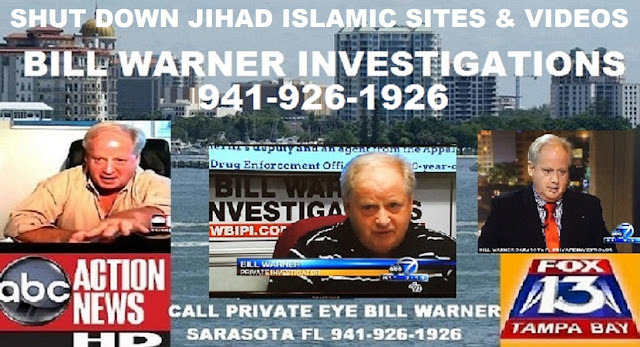 Investigator Links 3rd Jihadist Web Site To Tampa Host, Saturday, May 03, 2008, PRIVATE INVESTIGATOR BILL WARNER TRACKS AL-QAEDA WEBSITES TO TAMPA. 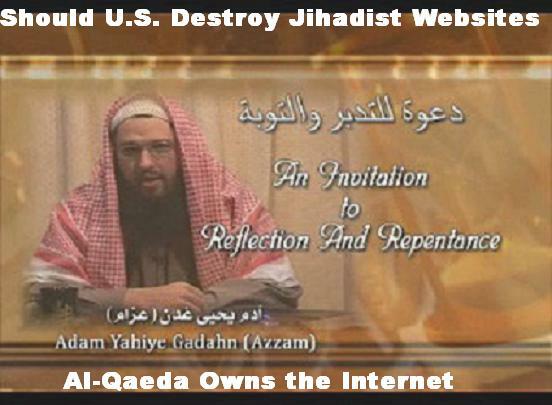 My energies have been focused on shutting down jihad/terrorism websites hosted in the USA that link to al-Qaeda, one of those websites is WWW.AL-EKHLAAS, which I was able to shut down on Jan 28th 2008 in Tampa Fl, see article click here and then again on Feb 1st 2008 in Phoenix AZ, see article click here, and then again on February 22nd 2008 in Tampa Fl, see article click here, with the aid of the Tampa Tribune and the Arizona Republic newspapers. Sept. 10th 2008 shut down of WWW.AL-EKHLAAS.org and 3 others, I had contacted several newspapers in Brisbane Australia where WWW.AL-EKHLAAS.org was ultimately hosted during the months of July and August 2008 and requested they get involved in shutting down the website, which appears to be still off-line. The Asia Pacific Network Information Centre (APNIC) in Brisbane is the Regional Internet Registry for the Asia-Pacific region (Malaysia), if they shut down the site it is shut down everywhere. I had contacted the editor, three investigative reporters and the senior reporter at “The Australian Newspaper”, “The Brisbane Sun” and the “Herald Sun” and APNIC and provided the information on the al-Qaeda site www.al-ekhlaas.org ultimately hosted out of Brisbane. The mirror site http://www.al-ekhlaas.net/ also appears to have been shut down. 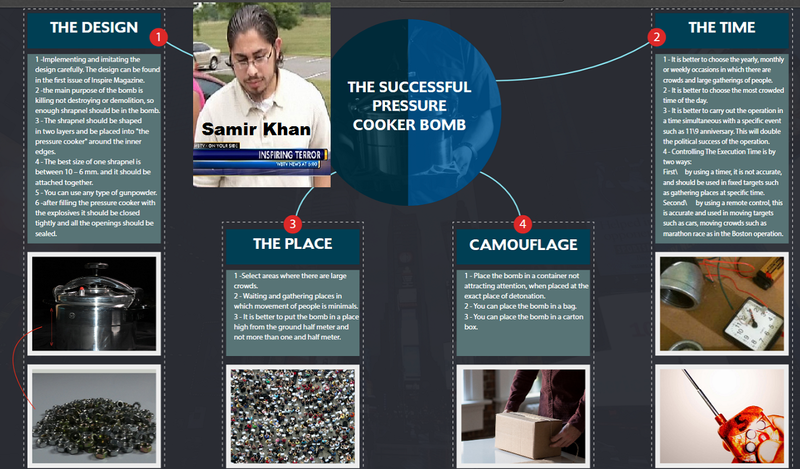 VICE NEWS: The FBI's first official documentation of when it learned that Samir Khan had connected with Anwar al-Awlaki: November 2008. The file says, "Samir Khan has been in contact with Anwar Aulaqi, an FBI San Diego subject who was acquainted with two of the 9/11 hijackers [of American Airlines Flight 77] while serving as the Imam at a mosque in San Diego, California." The files show that Khan was also under physical surveillance by the FBI. On January 6, 2009. Another file shows an FBI agent requesting permission on January 29, 2009 to travel to the Columbia, North Carolina field office to conduct surveillance on Khan. 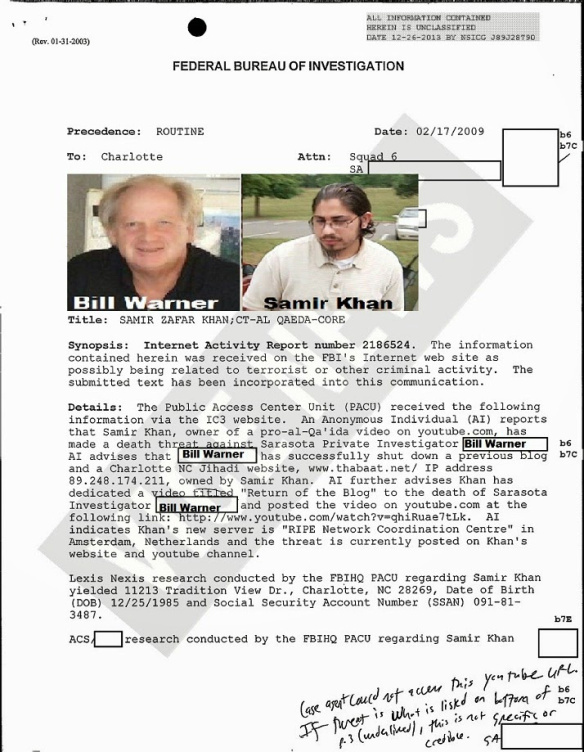 One file from February 2009 shows that an FBI counterterrorism agent sent a report to the Charlotte field office to report that the bureau's Public Access Center Unit received an anonymous tip on its "Internet Crime Complaint Center" website claiming that Khan made a death threat against a Sarasota, Florida private investigator, whose name was redacted from the FBI files. A news report about the incident, however, revealed that the private investigator is Bill Warner, who allegedly was responsible for shutting down Samir Khan's blog. 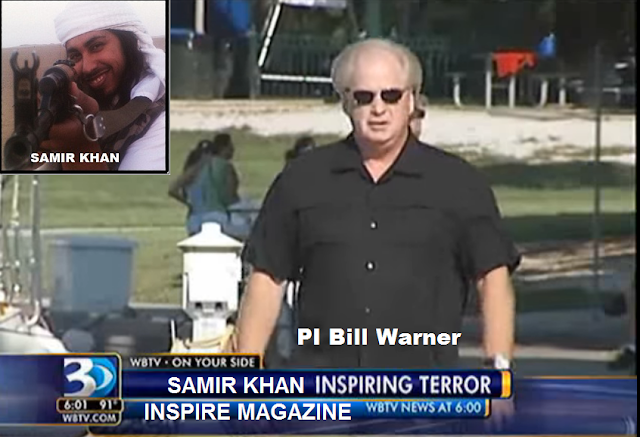 VIDEO ABOVE: Al-Qaeda propagandist Samir Khan the author of the online terror magazine 'Inspire" posted a video threatening Sarasota PI Bill Warner. The Return of the Blog January 5, 2009 on http://revolution.thabaat.net/?p=706. Posted by admin الحمد الله; After a brief halt, our blog has returned. The blog was not shutdown due to any hacks or infiltration or heavy traffic or server reports, rather it was shutdown on our own accord in order that we may move the servers". KILL BILL VOL 3..."We apologize for the delay, however the move is successful and this will be permanent, In Sha’ Allah. 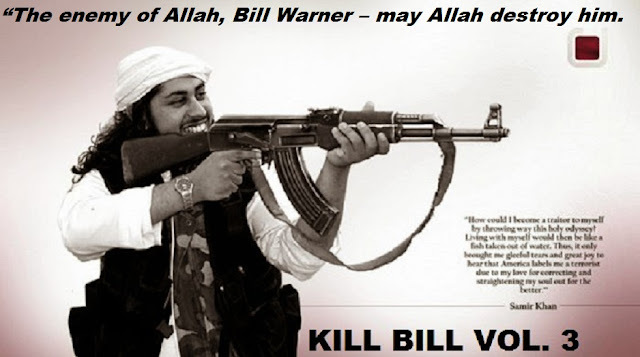 The lying enemy of Allah, Bill Warner - may Allah destroy him --- claimed that he was the one who shut down our blog. Let this be a testimony that this disbeliever is a liar". "May Allah send a hurricane over Bill Warner's house so that he can be wiped out, humiliated. In addition, al-Thabaat forums are back up. We have dedicated a video to the return of the blog and to strike fear in the heart of the Kuffaar Bill Warner". 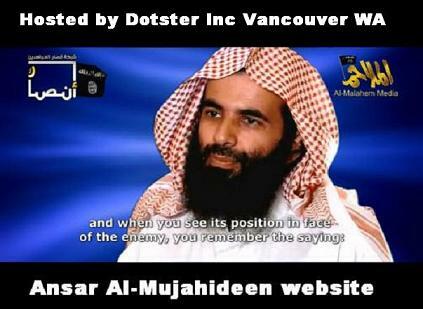 Sunday, September 28, 2008, DEATH THREAT POSTED ON THE YOUTUBE ACCOUNT OF PRIVATE INVESTIGATOR BILL WARNER BY SALMAN AL FARSI OF AL-MUHAJIROUN, WHAT TOOK SO LONG? jamalsaid24 ….”DEATH BE UPON YOU (BILL WARNER) AND THE AMERICANS AND THE BRITAIN’S AND THE WEST AND ALL OF THE ENEMIES OF AL ISLAM, AND THEN YOU WILL SEE WHEN YOU DIE HOW GREAT WAS THE PUNISHMENT OF ALLAH SUBHANNA WA TAL’A (THE ONLY GOD AND THE TRUTH)”… To view this comment, visit your profile , Bill Warner, on YouTube. UPDATE: Samir Khan The Inspired Terrorist That Hellfire Drones Couldn’t Silence Had Threatened to Kill Bill Warner a Sarasota PI. 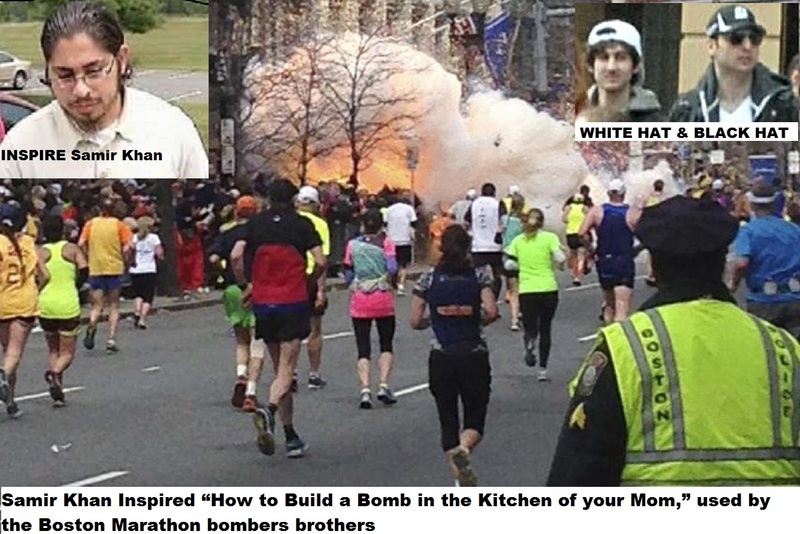 "Investigators' early portrait of the two brothers accused in the Boston marathon pressure cooker bombings suggests they were driven by extremist Islamic beliefs and told the investigators that they had learned about building explosive devices from Inspire, the online English magazine of the Al-Qaeda affiliate in Yemen set up and authored by Samir Khan." On Jan. 8, 2009, the FBI raised Khan’s investigation priority from “IT” to “core,” an indication that FBI agents believed that he was not just an al Qaida supporter but someone in close contact with al Qaida’s core leadership. The next day, on Jan. 9, Charlotte agents contacted the FBI’s Hostage Rescue Team, a Quantico, Va.,-based special forces unit created to respond to terrorist incidents and hostage situations such as aircraft hijackings. A meeting was scheduled in Charlotte for “finalizing operational plans” five days later. 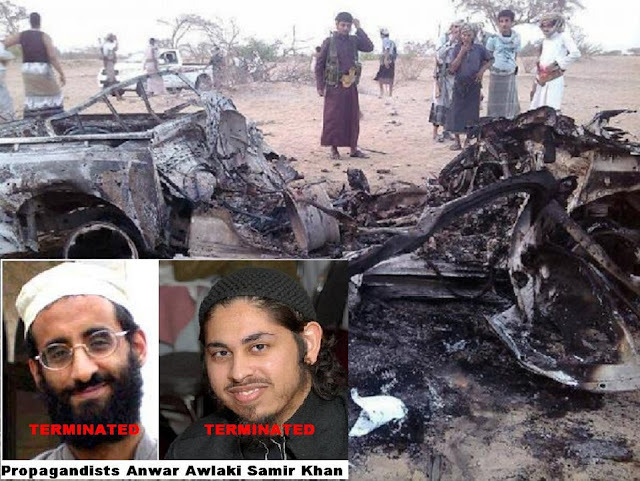 SAMIR KHAN CONTINUES TO INSPIRE TERRORIST BOMB PLOTS FROM THE GRAVE: Going on 8 years ago, a historic missile strike executed two U.S. citizens, Anwar al-Awlaki and Samir Khan in Yemen. But their viral terror blueprints are still being used by jihadists around the globe, Inspired by Samir Khan. Before Samir Khan’s jihadist dreams came to a sudden fiery end, he insisted, in his first interview with the national news media, The New York Times, that he had done nothing wrong. “I’ve never told anybody to build bombs,” he said. Two years after that interview, the Saudi-born U.S. citizen of Pakistani heritage would publish the most influential bomb-making manual since The Anarchist Cookbook, Inspire. Samir Khan blogged his way into the highest circles of Al Qaeda, waging a media war he believed was as important as the battles with guns on the ground. In 2009, he left his comfortable life in Charlotte for Yemen, started a slick magazine for jihadists called Inspire that featured political and how-to articles written in a comfortable American vernacular, and continued to digitally dodge government and civilian efforts (PI Bill Warner) to stop his self-described “media jihad.” Samir Khan would be dead at age 25, vaporized by Hellfire missiles fired by a drone on September 30th, 2011. 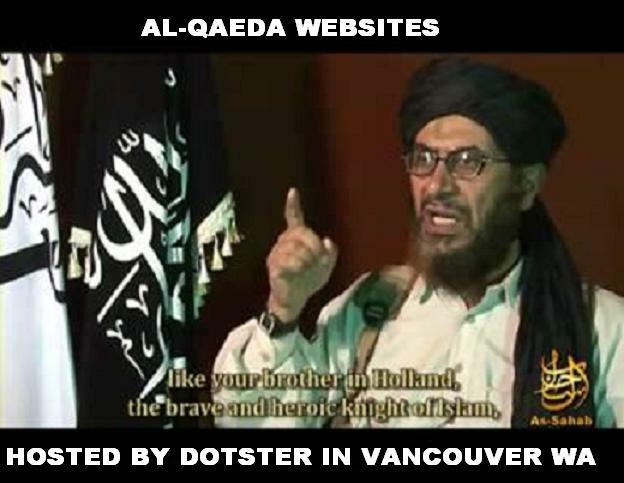 Labels: Al-Qaeda Web Forums Abruptly Taken Offline website forums had been shut down in Tampa and Phoenix by Cyber Vigilante Bill Warner.